Oil was formed from the remains of animals and plants that lived millions of years ago in a marine (water) environment before the dinosaurs. Over the years, the remains were covered by layers of mud. Heat and pressure from these layers helped the remains turn into what we today call crude oil . The word "petroleum" means "rock oil" or "oil from the earth." Crude oil is a smelly, yellow-to-black liquid and is usually found in underground areas called reservoirs. Scientists and engineers explore a chosen area by studying rock samples from the earth. Measurements are taken, and, if the site seems promising, drilling begins. Above the hole, a structure called a 'derrick' is built to house the tools and pipes going into the well. When finished, the drilled well will bring a steady flow of oil to the surface. The amount of crude oil produced (domestically) in the United States has been getting smaller each year. However, the use of products made from crude oil has been growing, making it necessary to bring more oil from other countries. About 58 percent of the crude oil and petroleum products used in the United States comes from other countries. What Fuels Are Made From Crude Oil? After crude oil is removed from the ground, it is sent to a refinery by pipeline, ship or barge. At a refinery, different parts of the crude oil are separated into useable petroleum products. 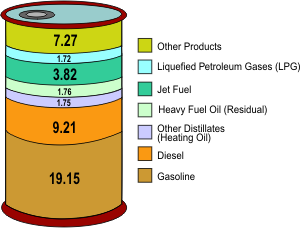 Crude oil is measured in barrels (abbreviated "bbls"). A 42-U.S. gallon barrel of crude oil provides slightly more than 44 gallons of petroleum products. This gain from processing the crude oil is similar to what happens to popcorn, it gets bigger after it is popped. note: The gain from processing is more than 5%. Products from oil (petroleum products) help us do many things. We use them to fuel our airplanes, cars, and trucks, to heat our homes, and to make products like medicines and plastics. Even though petroleum products make life easier - finding, producing, moving, and using them can cause problems for our environment like air and water pollution. Over the years, new technologies and laws have helped to reduce problems related to petroleum products. As with any industry, the government monitors how oil is produced, refined, stored, and sent to market to reduce the impact on the environment. Since 1990, fuels like gasoline and diesel fuel have also been improved so that they produce less pollution when we use them. Exploring and drilling for oil may disturb land and ocean habitats. New technologies have greatly reduced the number and size of areas disturbed by drilling, sometimes called "footprints." Satellites, global positioning systems, remote sensing devices, and 3-D and 4-D seismic technologies, make it possible to discover oil reserves while drilling fewer wells. Plus, the use of horizontal and directional drilling make it possible for a single well to produce oil from much bigger areas. Today's production footprints are only about one-fourth the size of those 30 years ago, due to the development of movable drilling rigs and smaller "slimhole" drilling rigs. When the oil in a well is gone, the well must be plugged below ground, making it hard to tell that it was ever there. As part of the "rig-to-reefs" program, some old offshore rigs are toppled and left on the sea floor to become artificial reefs that attract fish and other marine life. Within six months to a year after a rig is toppled, it becomes covered with barnacles, coral, sponges, clams, and other sea creatures. If oil is spilled into rivers or oceans it can harm wildlife.When we talk about "oil spills" people usually think about oil that leaks from ships when they crash. Although this type of spill can cause the biggest shock to wildlife because so much oil is released at one time, only 2 percent of all oil in the sea comes from ship or barge spills. The amount of oil spilled from ships dropped a lot during the 1990's partly because new ships were required to have a "double-hull" lining to protect against spills. While oil spills from ships are the most well-known problem with oil, more oil actually gets into water from natural oil seeps coming from the ocean floor. Or, from leaks that happen when we use petroleum products on land. For example, gasoline that sometimes drips onto the ground when people are filling their gas tanks, motor oil that gets thrown away after an oil change, or fuel that escapes from a leaky storage tank. When it rains, the spilled products get washed into the gutter and eventually go to rivers and the ocean. Another way that oil sometimes gets into water is when fuel is leaked from motorboats and jet skis. A refinery is a factory where crude oil is processed into petroleum products. Because many different pollutants can escape from refineries into the air, the government monitors refineries and other factories to make sure that they meet environmental standards. When a leak in a storage tank or pipeline occurs, petroleum products can also get into the ground, and the ground must be cleaned up. To prevent leaks from underground storage tanks, all buried tanks are supposed to be replaced by tanks with a double-lining. This hasn't happened everywhere yet. In some places where gasoline leaked from storage tanks, one of the gasoline ingredients called methyl tertiary butyl ether (MTBE) made its way into local water supplies. Since MTBE made water taste bad and many people were worried about drinking it, a number of states banned the use of MTBE in gasoline, and the refining industry voluntarily moved away from using it when blending reformulated gasoline. Gasoline is used in cars, diesel fuel is used in trucks, and heating oil is used to heat our homes. When petroleum products are burned as fuel, they give off carbon dioxide, a greenhouse gas that is linked with global warming. The use of petroleum products also gives off pollutants - carbon monoxide, nitrogen oxides, particulate matter, and unburned hydrocarbons - that help form air pollution. Since a lot of air pollution comes from cars and trucks, many environmental laws have been aimed at changing the make-up of gasoline and diesel fuel so that they produce fewer emissions. These "reformulated fuels" are much cleaner-burning than gasoline and diesel fuel were in 1990. In the next few years, the amount of sulfur contained in gasoline and diesel fuel will be reduced dramatically so that they can be used with new, less-polluting engine technology. 3. Who percent of crude oil does the US get from other countries?